The IKL school offers learning through movement in all its teaching formats. Enjoy dynamic learning through theory, practical experiences, play and discussion. Immerse yourself in an international atmosphere of new and familiar encounters during class time and in sharing at our buffet-meal gatherings. 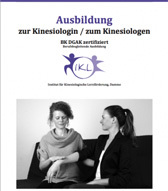 Training courses for the kinesiologist at our Institute: BK DGAK certified kinesiologist, Brain-Gym -Instructor, Touch for Health Instructor, Development kinesiology, My-Body and I Training. These trainings are in German. We are happy to help you find a personal translator. Please contact us. Courses of renowned international guest lecturers. Seminars of development kinesiology / My body and I in German language. We are happy to help you find a personal translator. 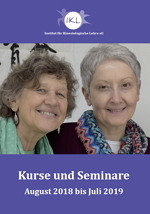 Courses with Renate Wennekes in Europe, Asia and America in the respective country language.